On the other side of the tie-up with Monsanto is Bayer, represented by STIKEMAN ELLIOTT partners Paul Collins, Susan Hutton and Jeffrey Brown. They won Canadian clearance for the deal in May 2018, conditioned on divestiture to BASF, which the bureau approved as a divestiture buyer in June. Collins, who happens to head the competition practice, also led for Jean Coutu in €2.87 billion sale to rival food and drug retailer Metro, which the bureau cleared conditionally in April 2018. In further deal work, Stikeman acted for Airbus in its partnership with Bombardier for the C Series aircraft programme; Potash in its merger with Agrium to create a global supplier of crop inputs; and D+H Corp in its acquisition by Vista Equity Partners. The team also advised convenience store and fuel retail chain CST in its three-way deal with Couche-Tarde and Parkland Industries. Michael Kilby acted for medical imaging technology company Novadaq in its sale to Stryker. 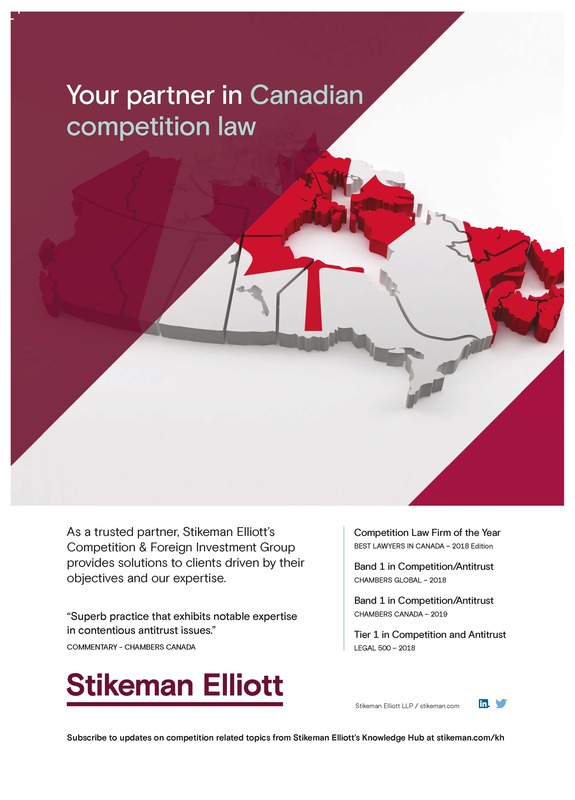 Stikeman is counsel to Ultramar in the petrol pump follow-on litigation; Air Canada in the air cargo class action; multiple clients in various auto parts investigations and class actions across Canada; and NYK Line in a proposed class action brought against members of an alleged global shipping cartel. Eliot Kolers and Katherine Kay represent Sobeys in the high-profile investigation of an alleged 14-year bread price-fixing conspiracy. Kay defended publisher HarperCollins in the Canadian e-books saga before the Competition Tribunal commenced by the Commissioner of Competition. After three other major publishers and Apple saw their original settlements with the bureau rescinded following a challenge by e-books retailer Kobo, HarperCollins originally refused to agree to the second round of settlements. It finally negotiated a consent agreement with the Competition Bureau in January 2018 in only the second case to be brought under the civil competitor collaboration provisions introduced through amendments to the Competition Act in 2009. Partner Yves Martineau advised the Canadian Imperial Bank of Commerce in the Visa and Mastercard anti-steering settlements. The competition team at corporate heavyweight Stikeman Elliott has had a “hell of a run” since 2012, says its practice head Paul Collins. That year saw straight-talking Collins return to the practice after two years heading up the Competition Bureau’s mergers branch, and rival lawyers admit the practice has taken off since then. In litigation, Stikemans’ personnel are similarly admired: partner and double Who’s Who Legal nominee Katherine Kay is perhaps Canada’s top competition litigator. Who’s Who Legal nominees Susan M Hutton and Lawson A W Hunter both have active regulatory practices in Ottawa. Collins likes to think the firm gets its pick of the trickiest deals before Canada’s competition bureau. It is hard to deny that Stikemans has been on many of the most complex reviews of the past year or so. Collins and rising star Michael Kilby represented newspaper company Transcontinental in the acquisition of 74 local newspapers from Quebecor. The bureau ended its review with inventive remedies to test claims that several titles were unviable as competitors. The team also helped supermarket chain Sobeys buy Safeway’s 213 Canadian stores for C$5.8 billion, which required minute market-by-market analysis. Right now, Collins is working with Botox-maker Allergan in a US$54 billion hostile takeover by Quebec’s Valeant Pharmaceuticals. The hostile nature means timing and access to information are especially tricky, Collins says. Merger control lawyers at Stikemans will often work on the bureau’s abuse of dominance investigations. But for criminal and litigation work, Kay is in charge. She and fellow litigators Eliot Kolers, Danielle Royal and Montreal-based Yves Martineau advise clients in multiple investigations class actions, including up to a dozen auto parts companies accused of colluding with rivals to fix prices. Kay has a long relationship with Air Canada, having represented the country’s biggest airline in a challenged joint venture with United Airlines and has long served as counsel in the air cargo case. The team is representing CIBC against a swell of class actions challenging interchange-fee rules, and has also had success recently on behalf of Tim Hortons and distributor Gordon Food Services in two lawsuits that test when plaintiffs can bring antitrust counts in franchise lawsuits.